It has been a busy week and now that the contractors are finished upstairs, my wife and I have gotten back to framing. The bathroom is the most difficult bit with a combination of water damaged sub floor and dodgy 1870s wall studs. It was obvious that in 1870, the carpenters were running out of the best lumber and the bathroom walls were made of whatever they had left which had more in common with soft pretzels than anything else. It was actually 2″x 4″ in size but it was soft pine that can’t hold a screw and large knots caused it to bend and twist in the most agravating ways. This was okay in 1870 when the walls were covered in lath and plaster which could handle the irregularities. Modern drywall; however, requires a more consistent substrate which some of these old walls could not provide. 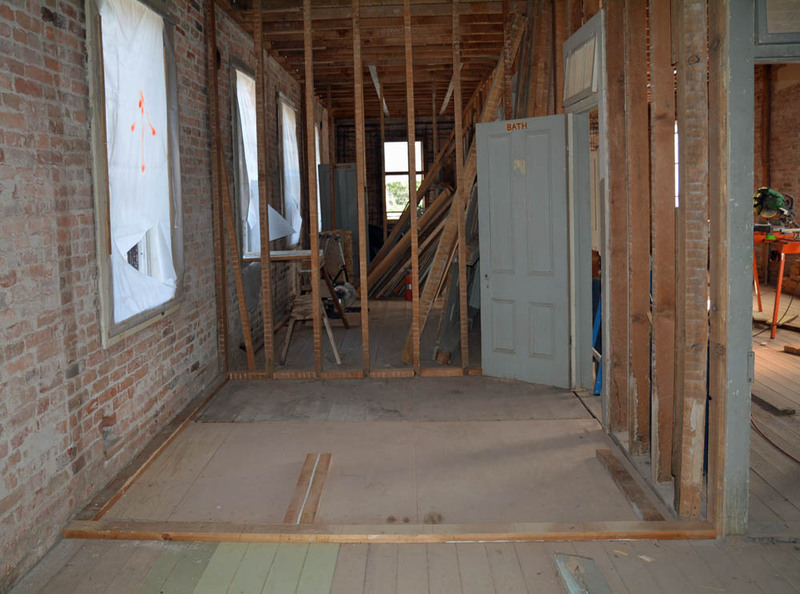 In the picture, I’ve used a mix of 1870s lumber, 1920s lumber recycled from the first floor and new lumber. I have to say the the new and 1920s lumber is much easier to use since the size is consistent and there is very little of the pretzel thing going on. 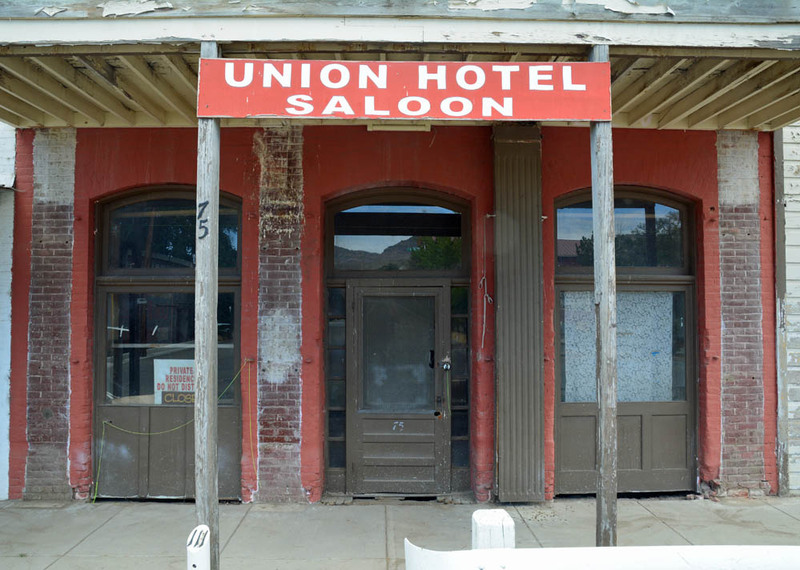 While I was wrestling with the walls, my wife worked on the pilasters at the front of the saloon. The pilasters were wood instead of the typical iron that one would see up in Virginia City and that cast some doubt on their originality. Then last week, we were shown a photo that was run in the papers last year. 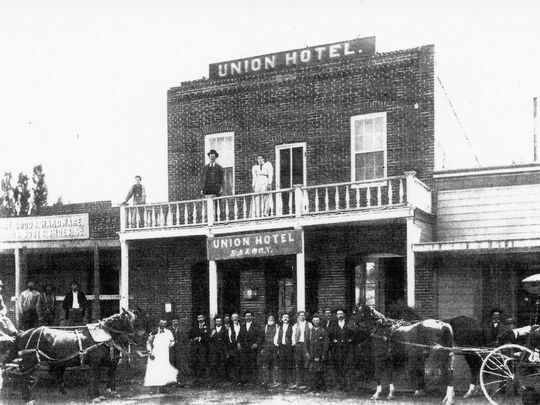 It shows the hotel without the pilasters and a large gas lantern to the left of the front door. At one point in time, the balcony was removed and the pilasters were added for decoration in its absence. Once the balcony was rebuilt, the pilasters remained but were inappropriate to the original design. Based on this hypothesis and the photo, we’ve gotten approval from the Historic Commission to remove the pilasters. What we found underneath was really interesting too. 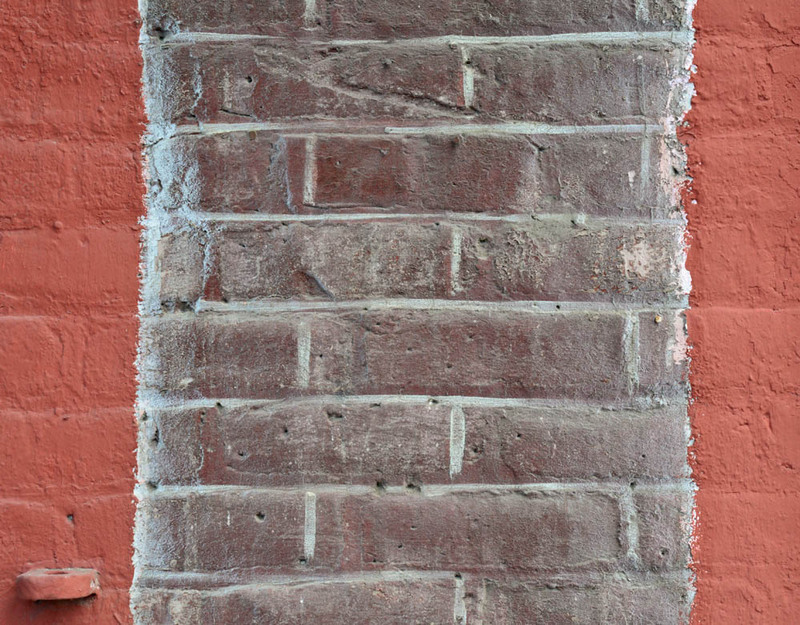 The brick wall underneath the pilasters was “penciled” which means that it had been painted brick color with the mortar penciled in with gray paint. Is this part of the original 1800s finish? 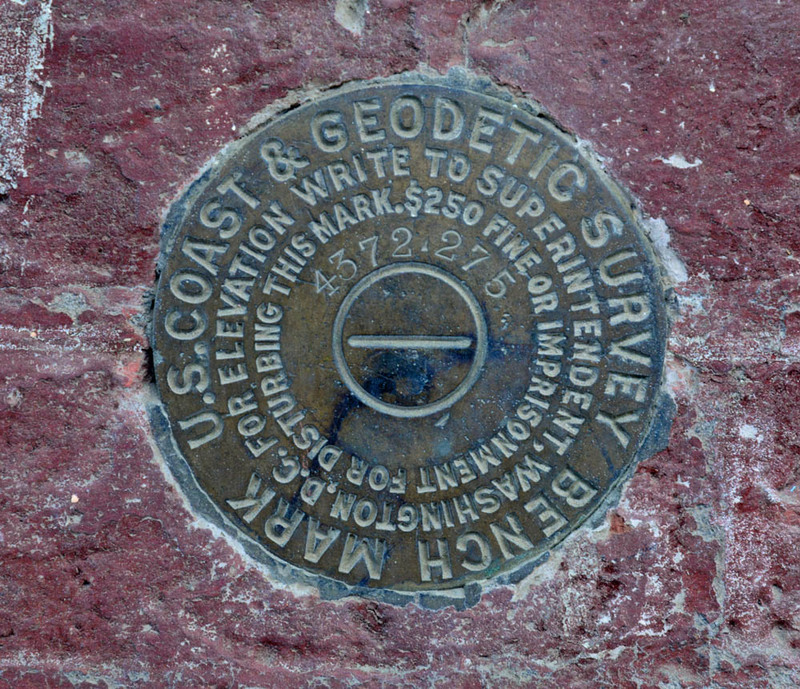 And if that wasn’t good enough, the far left pilaster was hiding a survey marker! Now, I have to figure out when the markers was placed. The eclipse happened yesterday and while the sky dimmed, our fearless contractors kept working despite the waning light inside the hotel. 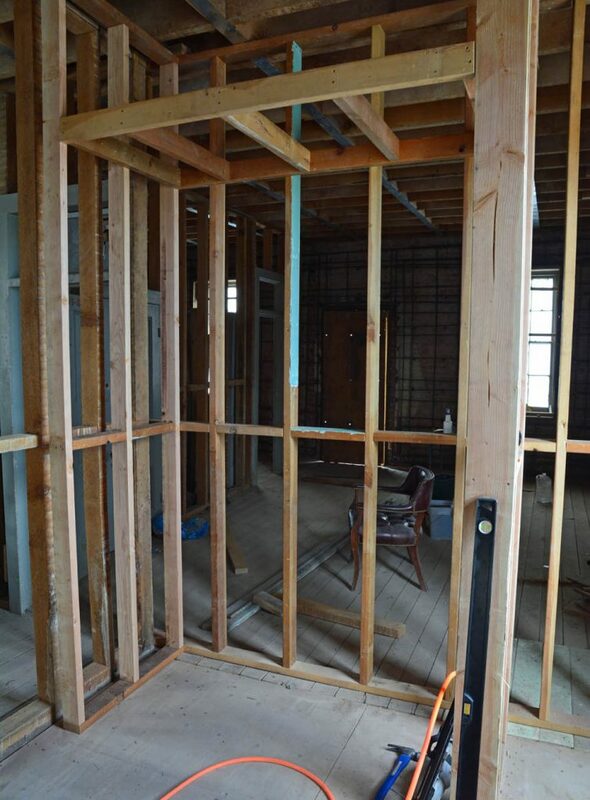 The plumbers kept plumbing and the framers hid in the basement with a huge wood girder that they were securing to the bottom of a shear wall. Not wanting to disturb their fun, I went outside to witness the solar spectacle. As the project manager and chief check writer, it’s my privilege to goof off now and again. I didn’t have the proper filter to take sun shots so I simply photographed the shadows which were easily as dramatic as the sun itself. 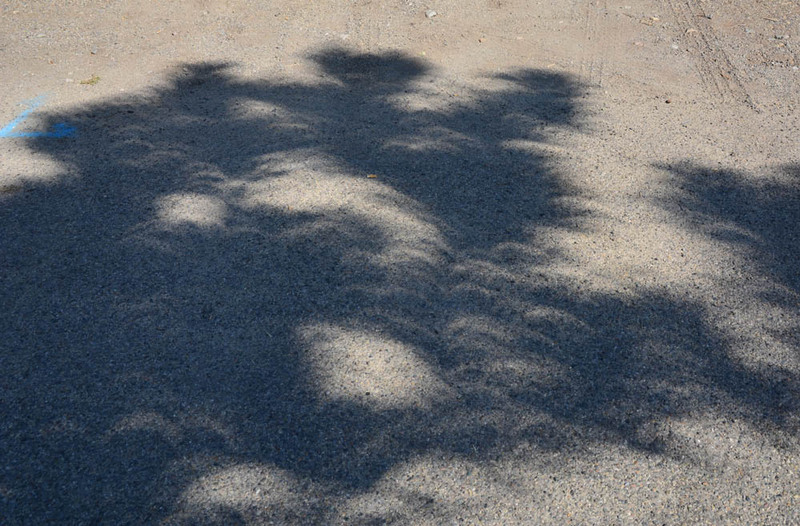 The crescents you see are the image of the crescent sun projected through tree branches. Once the two minute break was over and the sun was back to full sunburn mode, I went back to the never ending task of cleaning out the back yard. This time, it was in anticipation of the digging the new sewer line but, of course, I was met by ardent objections from the local wildlife. These guys have been plaguing us all summer and upon reflection, it seems that their meanness is probably their own downfall. 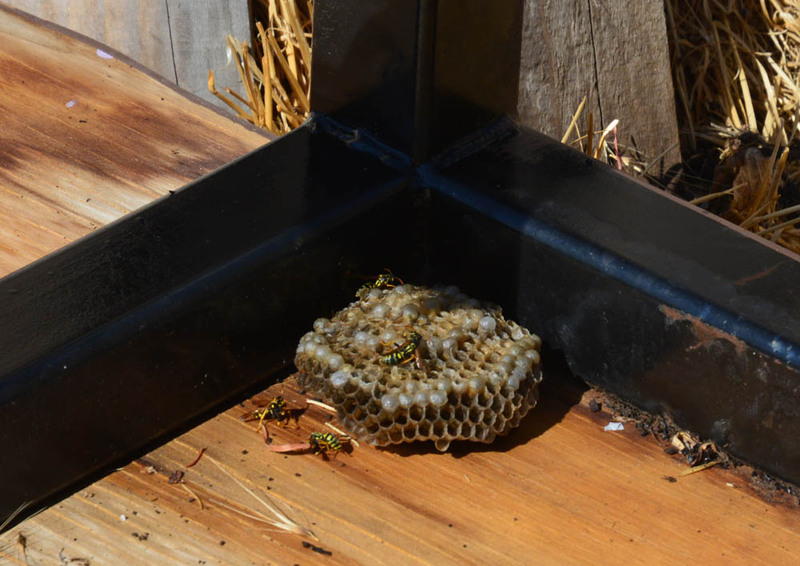 If they weren’t so aggressive, I wouldn’t be chasing them with a can of wasp spray. Now that the yard is debugged for the moment, I’m happy to report that we finally have a few walls going up instead of the coming down. 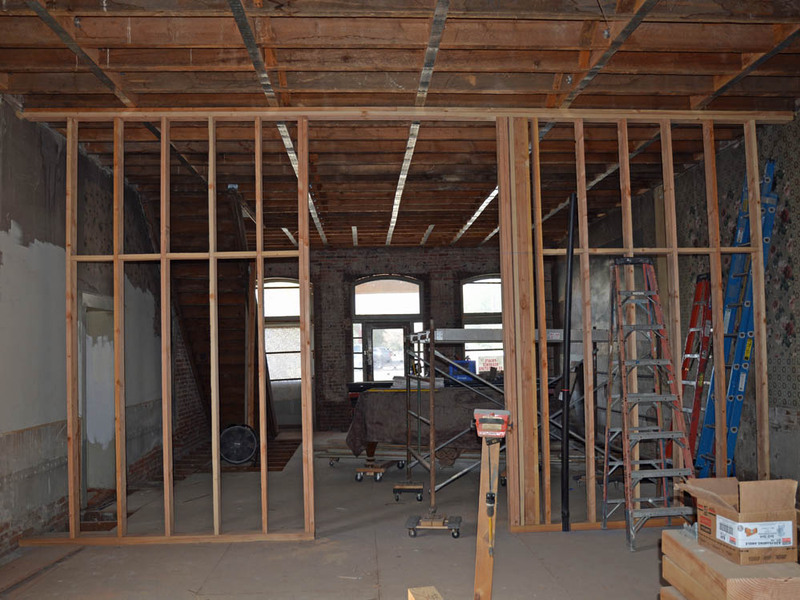 On the first floor, we have the afore mentioned shear wall which is currently a sheer wall until we get some plywood on it. 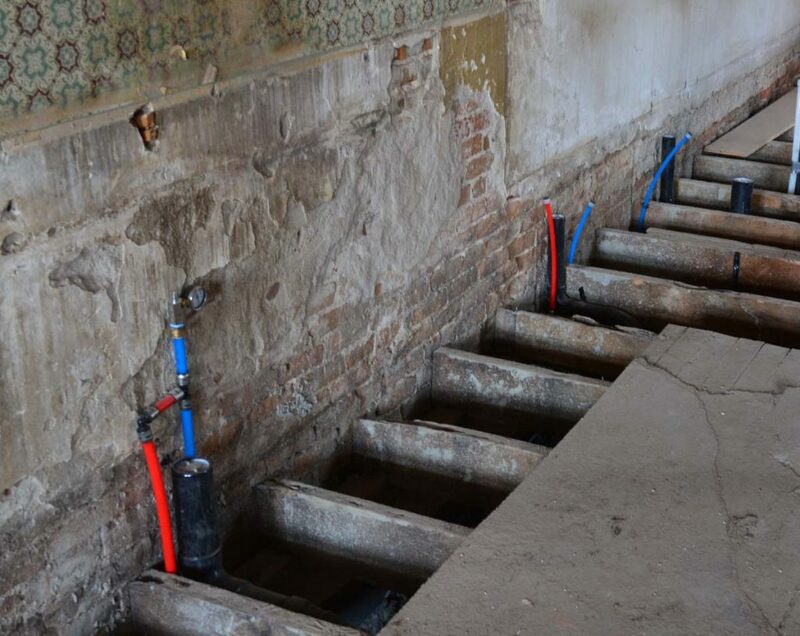 Upstairs, I’ve installed the sole plates in the bathroom so that the plumbers will know where to put their pipes. The tub will be on the right and the toilet on the left near the window with the wonderful view of the neighbor’s roof. The plan is to install a cafe curtain at the bottom of the window to hide the roof and provide a nice view of blue sky and the mountains beyond while one sits and ponders. You can also see the green floor boards in the lower left. 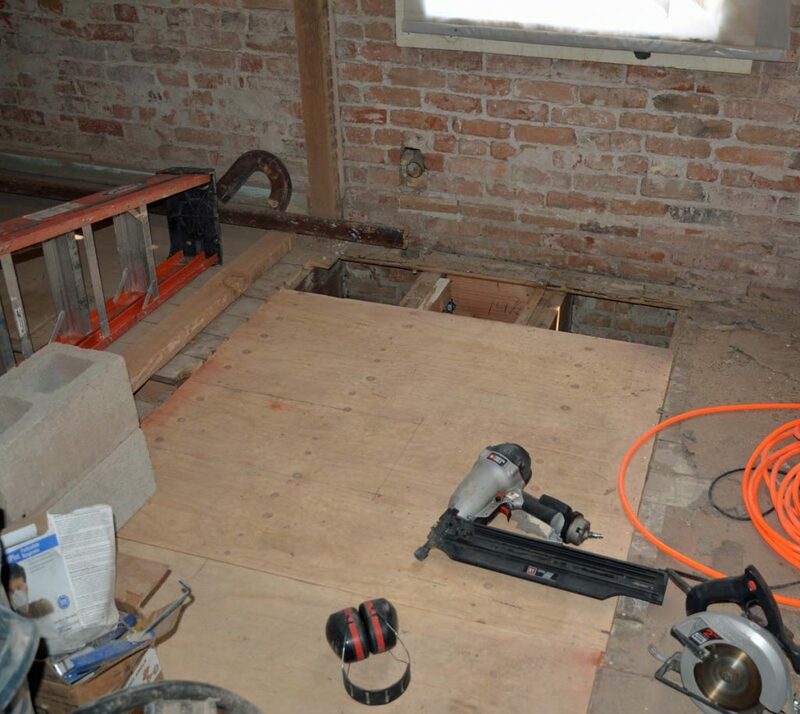 I used some of the planking from the original saloon partition wall to repair holes in the floor. As it turned out, it was the same thickness as the original floor boards and had a very similar profile so the tongue and groove parts of it fit the original floor pretty closely. Of course, the biggest win is that I didn’t have to buy new lumber for the job. We now have plumbing going in but it entailed a bit of prep work before the guys with the pipes showed up. 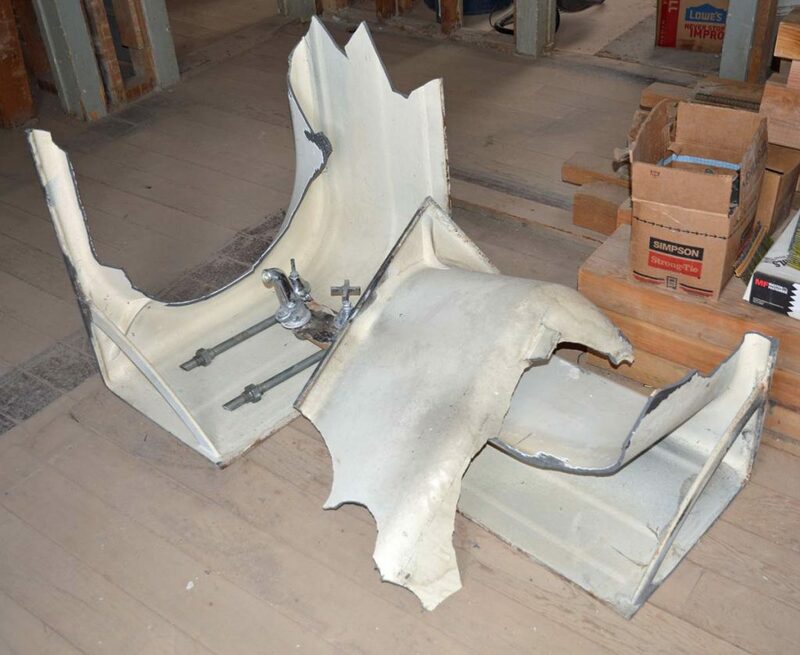 The first order of business was to get rid of the iron bathtub on the second floor. The original plan was to haul it downstairs and place it on the sidewalk with a “FREE” sign. We were assured by a neighbor that the tub would vanish within 24 hours and reappear as a horse watering trough somewhere else. This was a really nice idea but the tub was so heavy that moving it 6″ just earned me a sprained hand. To make things easier, I decided to tip the tub on its side so I could finish removing the iron drain pipe thus making the tub lighter by twenty pounds. In a moment of brilliance, I used a 2×4 as a lever to get the tub on its side but as the tub tipped, the drain pipe fell out on its own saving me the trouble of prying it loose. This was great except that it fell through the floor and bounced off the bar in the saloon below leaving a humongous dent in the wooden bar top. In the future, I’ll just have to explain this away as the result of a wild west brawl where someone broke a whiskey bottle. It sounds much more adventurous that way. So, on to plan B. The sledge hammer was twenty bucks and the trip to the chiropractor was forty but seeing the pile of manageable pieces, priceless. After that, it was fairly easy to pry out the stinky rotting floorboards and replace them with a plywood sub floor. On top will go cement board and period white tiles for a twenties look. Meanwhile, the plumbers started their work on the first floor. We decided to go with PEX for the hot and cold water. Copper was out because of the expense and it was a close match between CPVC which is a hard walled product and PEX. The PEX won because of its ability to freeze without bursting.